Fast Cars? Food? Shopping? I’m In! We have few opportunities in our lives to become part of a legend. 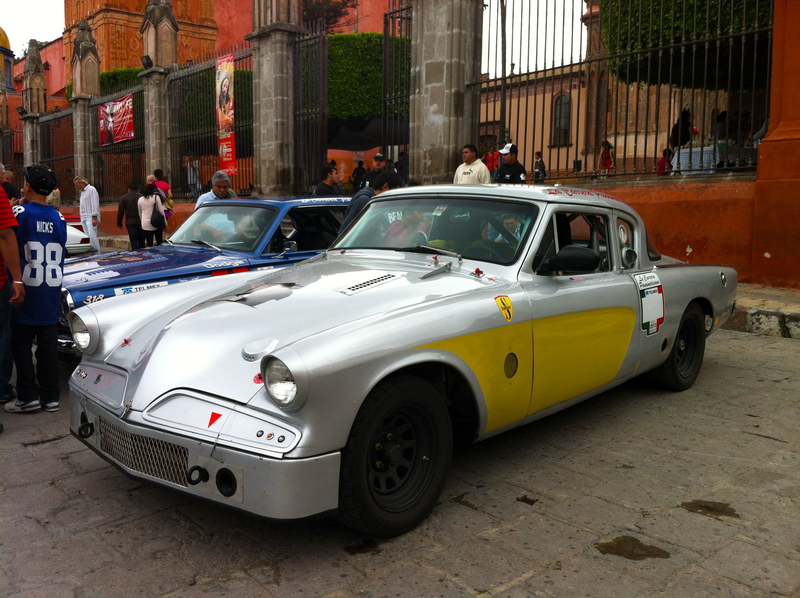 But La Carrera Panamericana, the Pan Am, is one of those rare opportunities. 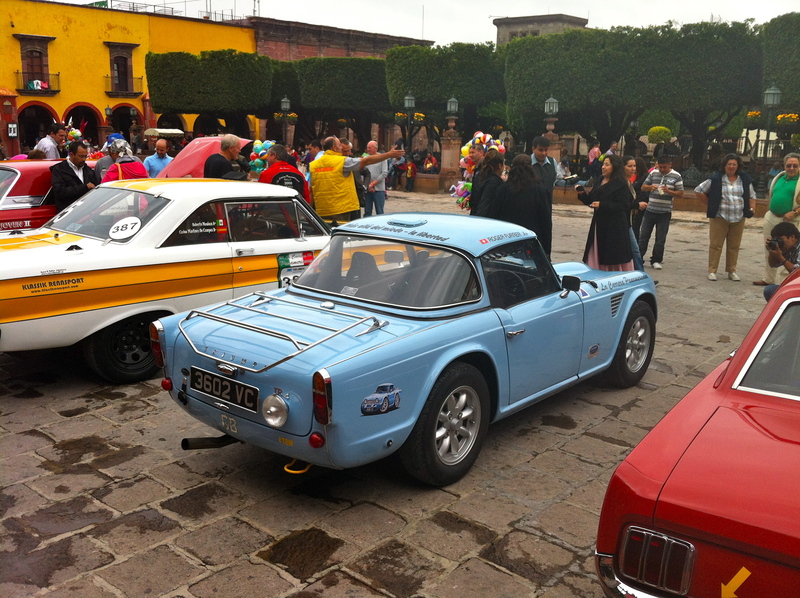 It is the last open, top-speed road race of its kind in the world. No one can predict how long it will survive in this modern age. 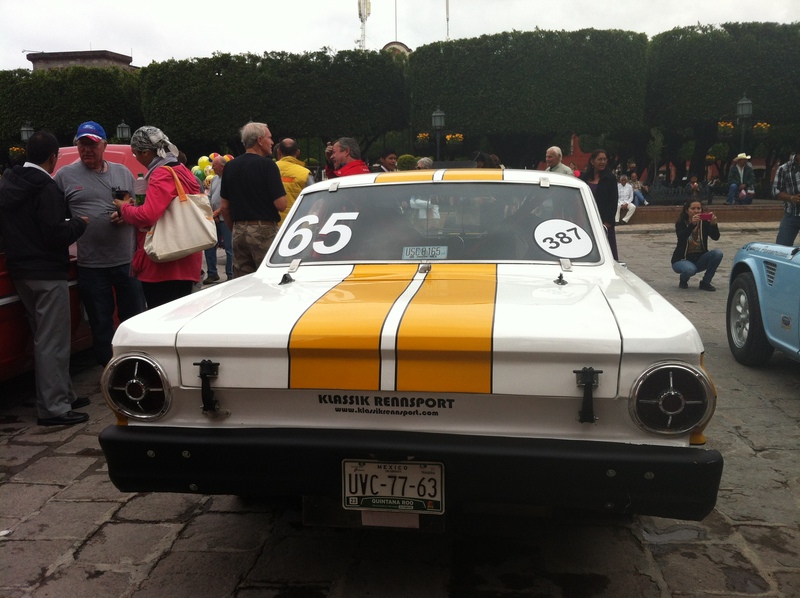 This October, 100 vintage racecars–each with a driver and co-driver—will line up in southern Mexico for the 26th year to race nearly 2000 miles back to the north. It’s seven days of racing (time trials) over closed, paved roads, through some of the most beautiful country north of the Equator. Seven days of freedom. It’s a week of feeling very special and a lifetime of memories. Santa Rosa is also the home of a factory store which produces fine quality majolica using traditional methods and local clay: decorated by hand, these artisans create wonderful pieces for decoration, display and everyday use. And the prices are very good as well: place settings and serving pieces very similar to those used by the fine restaurants and offered by upmarket culinary stores in San Miguel are for sale here for 17 – 31% less than retail. 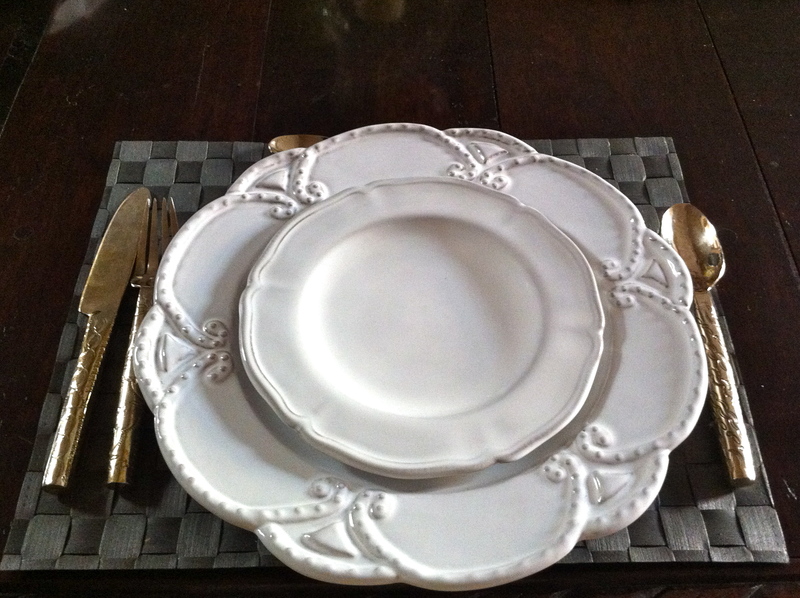 You can custom order by size, pattern and colour too: we ordered Chinese red luncheon plates in the Italianate style for less than $12 each, ready in 3 to 4 weeks. The selection can be a little overwhelming, so go with styles, sizes and colour schemes in mind. Shopping completed and with the race a few hours off, we needed to find a place for a long leisurely luncheon. Our best option, since the roads had been closed for the race, was the Restaurant de La Sierra. A cafeteria that could seat up to 350, it offered excellent sight lines, but a pretty average menu. We decided to stick with the basics and order guacamole and arrachera, that special thin long cut of marinated beef that is like a skirt steak, but uniquely Mexican in flavour, and frankly, pretty hard to mess up. 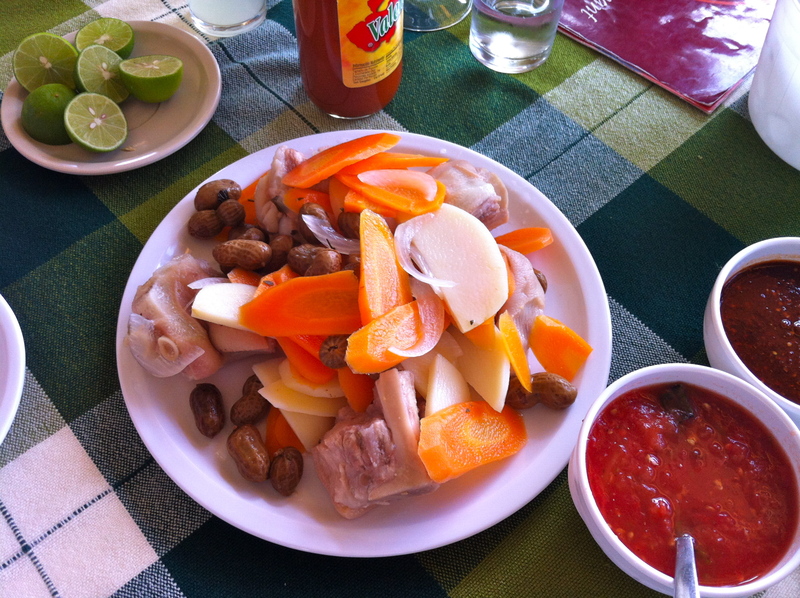 Feeling adventurous, I also ordered the house mescal and the manitas de cerdo, or pickled pigs feet. They were surprisingly tasty (I am a sucker for anything pickled) with a mild flavour and chewy texture. I learned later that they are a delicacy enjoyed in the American South, Asia (since the Ming dynasty) and any place that poor, thrifty eastern Europeans had settled. Like jars of pickled eggs and sausages, pickled trotters have a place on the counters of many Tennessee and South Carolina roadhouses. I also read that since they are so high in collagen, pig’s feet are considered a “super-food” in the quest for younger, more supple skin. Perhaps some rebranding is order however: “creme de couchon” anyone? 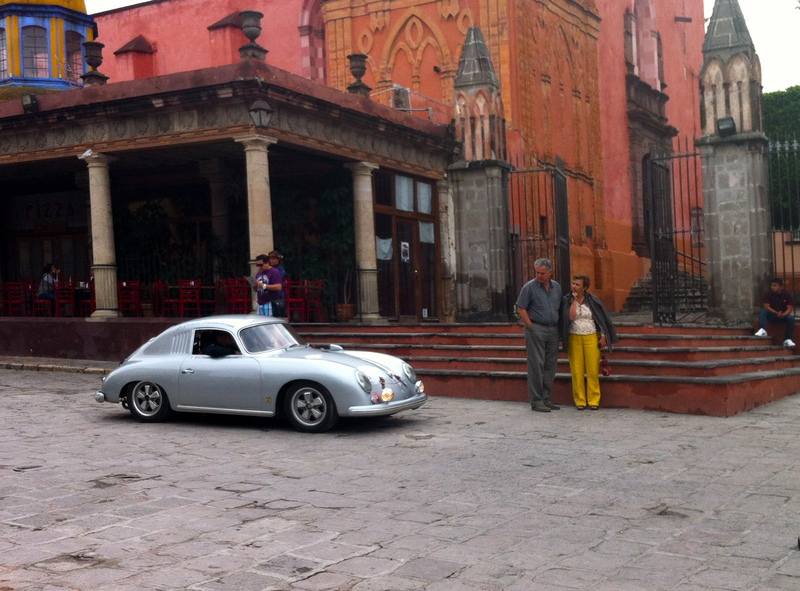 A few hours and a few mescals later, you could hear the high throaty pitch of the Porsche and the low baritone of a North American V-8 approaching the town. When they slowed to pass through Santa Rosa, you had a moment to appreciate the timeless design and the power of these vintage race cars before they accelerated up the hill and into the setting sun. Heading home later, we saw evidence of that power: a boxy blue European sedan, possibly a Volvo or Alfa Romeo, had lost control on the curve, sailed off the road and smashed head on into a large tree below. An ambulance was just leaving the scene. I emailed Gerie to get an update but no response as yet.